On occasion our Sparrow Academy director Elena Faulkner will need to be out of the office at the Academy and I get to fill in as the “Principal for the day”. As I type this I can hear a collective laugh of all of the teachers who sent me to “the office” over the years. I dare not name them, but they know who they are and they were right to do it. One of these days we had a young man who could not stop fighting with other students. He had started four fights and we were only two hours into the school day. He is a young man who has dealt with physical abuse at home and has been abandoned by several family members. And he was angry. Not subtly angry. Overflowing with anger. Often times these emotions come out at school because the students feel safe there. They don’t know how else to communicate their very intense emotions, and they erupt. In this case violently. After some very awkward silences only broken up by teachers coming into the office for supplies, God stepped in and showed a path. He placed the 23rd Psalm clearly on my heart. I printed it off and had this young man write it on the large white board in the office. He took his time. He wrote it beautifully. At times he seemed to stare at the sentence that he had just written. He was quiet and peaceful. y en la casa del Señor habitaré para siempre. Then he zeroed in. He pointed to the word “house” or “casa”. He said that this is the house that he wants to live in. (Again, he is glowing at this point) I asked him why he said that, he pensively responded with confidence that it is a house of hope, and love, and the last thing he said was “it’s safe”. I printed the chapter for him on card stock to take home. 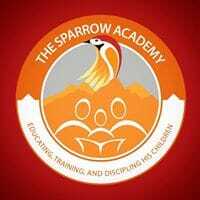 He smiled, loaded up on the bus, and that was a day at the Sparrow Academy.